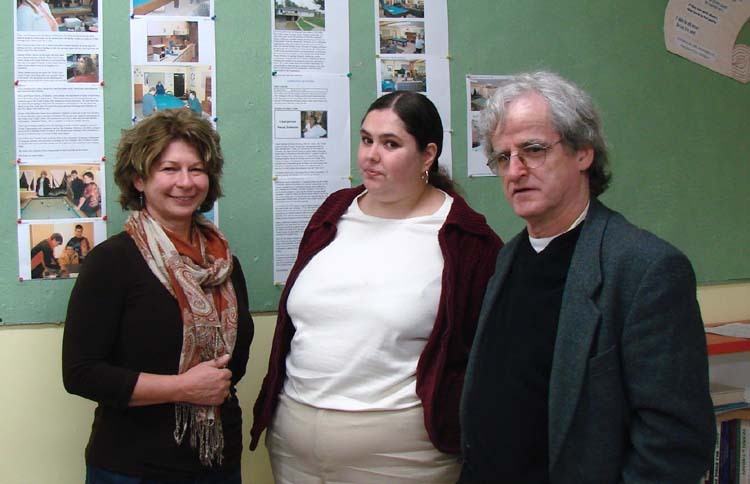 Darlene Hillier, Vice-Chair of the Valley East Youth Centre's Board of Directors, shown in the middle of the photo, was very optimistic about the future of the Centre after meeting with representatives of Town Youth Participation Stategies (TYPS). Dale Pearson, on the left, is the Project Co-ordinator and Kevin Morris is Director of TYPS. Town Youth Participation Strategies works with individual youth, youth centres, youth councils and other youth serving organizations, providing support and resources which will enable them to fulfill their mandates and missions. TYPS is a registered charity, relying on membership fees and donations to fund its activities and projects. Individual memberships cost $25 while the annual fee for organizations such as the Valley East Youth Centre is $250. Pearson and Morris were meeting with Darlene to discuss the procedure for accessing a $1000 Tobacco Grant which is being given to the organization for producing a short video clip designed to promote avoidance of smoking among youth. 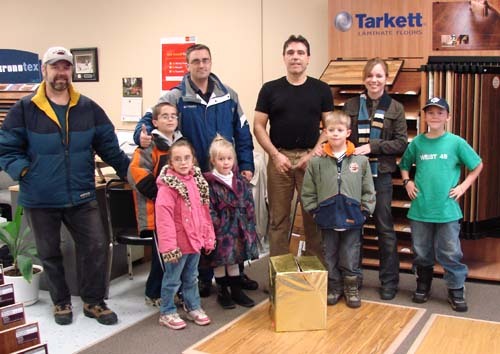 The Valley East Youth Centre has also qualified for a $10,000 Sustainability Grant from TYPS. 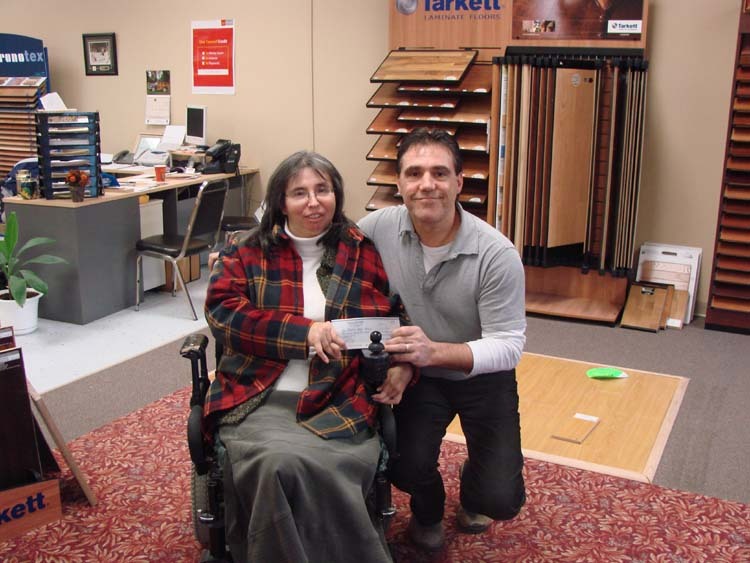 The grant would be a tremendous boost for the Centre according to Darlene. "It would allow us to get through the winter and even hire some part-time staff so that we can keep the Centre open on another day. Right now we are only open Fridays from 6 to 10 p.m., but the grant would allow us to open on Saturdays as well." Hillier sees this as a stepping-stone to the future for the "longest serving youth centre in Ontario". "We were created as a provincially-funded organization in 1982," explained Hillier. "We were open seven days a week with a full-time staff of three. The Valley East Youth Centre was the springboard for all of the other Youth Centres in the region. Once funding was pulled in 1995 we've faced an uphill battle to keep going." Hillier and Susan Johnston, Chair of the Valley East Youth Centre Board of Directors, are hopeful that the new City Council will see fit to increase the funding that is allocated to the Youth Centre, which currently receives only $2400 per year, plus the use of the City-owned facility which was once housed the Valley East Parks and Recreation Department. 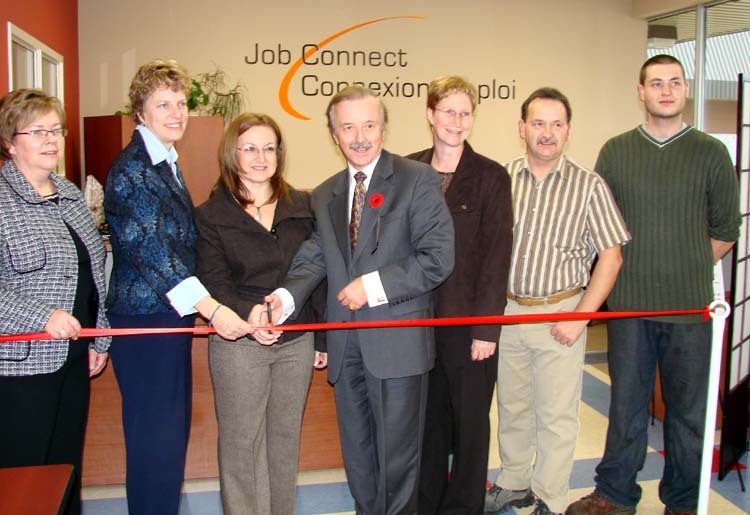 Sylvia Barnard, President of Cambrian College, and Denis Hubert, President of College Boreal, together with Job Connect representatives, officially opened a new Job Connect centre in the Val Est Mall in Valley East on November 9, 2006. The centre in Valley East is one of two new Job Connect sites in Greater Sudbury that bridge the gap between individuals seeking employment and employers seeking personnel. The other Job Connect centre, located in the Place Bonaventure Mall in Chelmsford, officially opened on October 19, 2006. 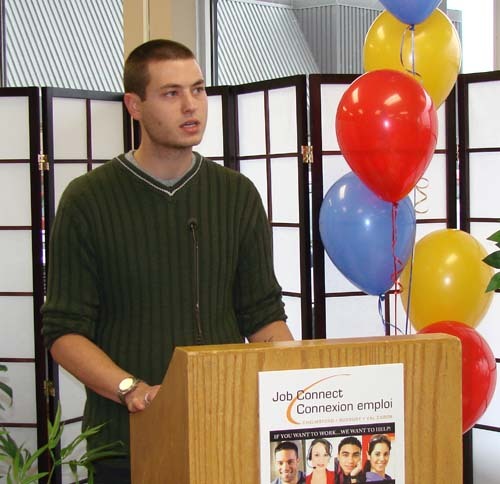 The Job Connect centre provides bilingual, convenient, and accessible employment services and is staffed from Cambrian College and College Boreal, who are partners in the initiative. Funded by the Ministry of Training, Colleges and Universities, the Job Connect centre provides free access to job search tools and career information; information on apprenticeships, occupations, and the labour market; and workshops on job search strategies and interview preparation. Participants in the official ribbon cutting ceremony included, from the left: France Belanger-Houle, Chef de Connexion Emploi; Sylvia Barnard, President of Cambrian College; Maryse Lavoie, Consultant, Skills Development Branch, Ministry of Training, Colleges and Universities; Denis Hubert, President of College Boreal; Sue Ferguson, Chair of Job Connect; Richard Jolivet, General Manager, Canadian Tire, Valley East; and Pat Cameron, an employee of Quik Lube in Hanmer. Pat Cameron, on the left, provided an impassioned speech about how he was able to utilize the services of Job Connect to get his career planning on track. "I made a lot of mistakes when I was young," Pat explained. "I fell in with the wrong crowd and ended up quitting high school. Eventually I found out that you just can't make it in this life without a proper education, so I turned to Job Connect for help." Cameron, who is married with a three-year old son, obtained his Grade 12 upgrading and is now training for a career in Mobile Electronics. "I am not sure where I would be now if it was not for the professional help I received from the staff at Job Connect. Richard Jolivet, General Manager of the new Valley East Canadian Tire explained how Job Connect helped the company recruit employees for the new site. "Job Connect took in all of the applications and then sorted out the top 200 prospects. They conducted interviews over four days and came up with out staff. 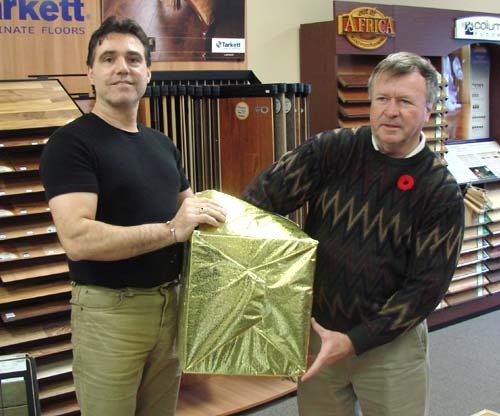 We would not hesitate to use their services again in the future. After spending the past 14 years living in Lebanon with her husband, Sam Zoghbi, Monique Laderoute, second from the right in the above photo, seemed to have it made. She and Sam had a great life. 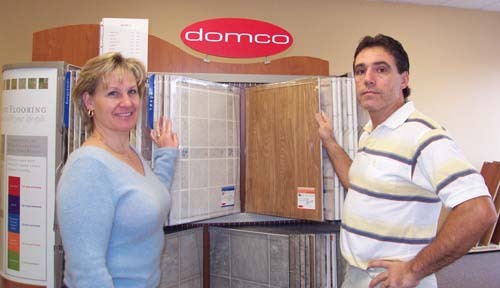 He was doing very well in the restaurant business and she was developing a solid reputation as a professional interior designer. And then around the middle of July 2006, their world was turned upside down when Israel invaded Lebanon and Monique was forced to flee from her home near Beirut and seek evacuation back to Canada. With their assets frozen in Lebanon, Monique and her two teenaged boys were only able to bring one suitcase each out of the country. The Laderoute's were able to secure space with 200 others on a luxury casino yacht and eventually made it back to Valley East. "I didn't even have enough money to make a phone call from the bus station," recalls Monique. "But even though I have nothing and I have to start out all over again on welfare with an empty apartment, I am so grateful to have escaped with my sons. I'm back home now, and I will never leave again." 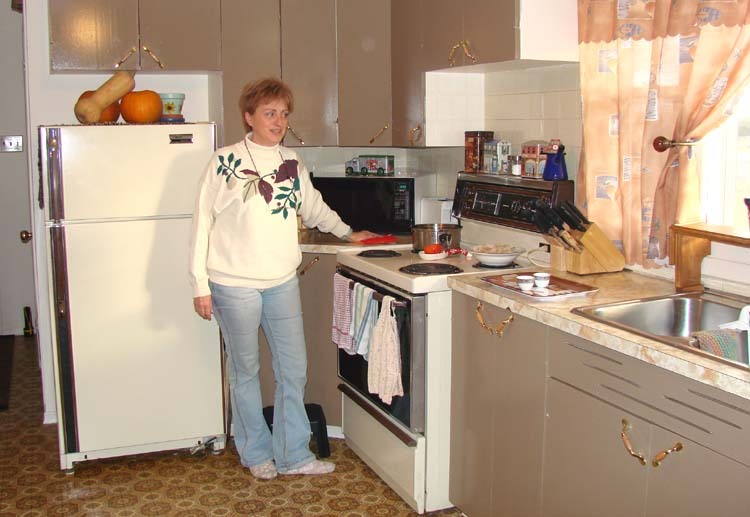 Today, Monique, stands in her newly refurbished kitchen, and expressed her extreme gratitude to the community of Valley East for coming to her assistance in her time of need. "At the beginning of October, I had nothing," Monique explained. "Then I discovered that this whole community is my family and it has been non-stop. People have been so kind to us and have been unbelievable in their support." 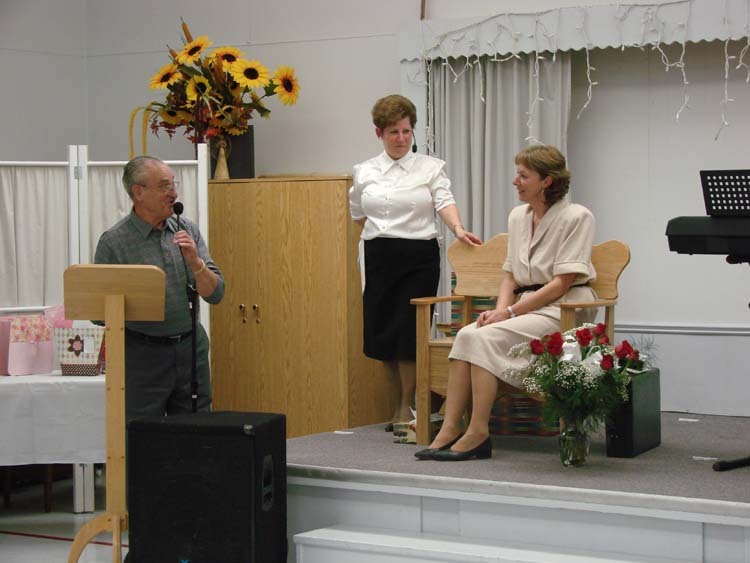 Ron Laderoute expresses best wishes to Danielle Gervais, seated, during a special farewell reception held at The Golden Age Centre in Hanmer on November 10, 2006. Standing in the background is Jeannine Blais, Master of Ceremonies for the occasion. Gervais was Executive Director of the club since 1994 and served under the Presidents shown in the photo below. 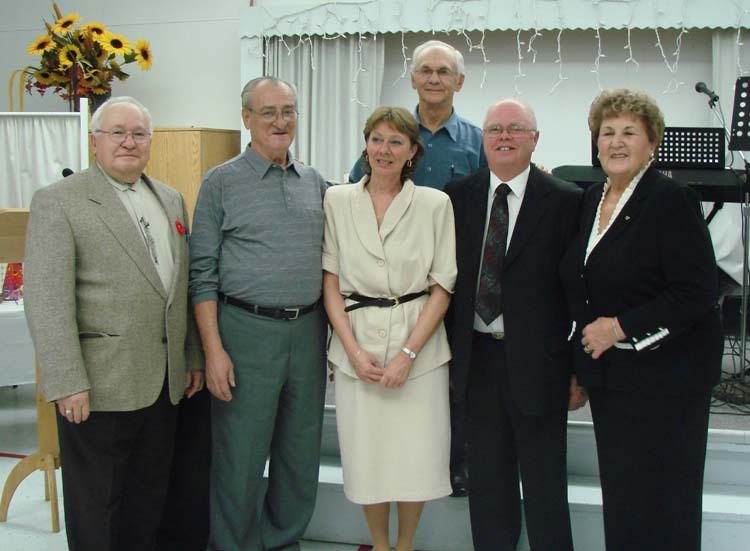 Past Presidents who served during Danielle's time with the Golden Age Club, included, from the left: Henri Dufresne; Ron Laderoute; Yvon Sonier in the back; Gilles Rieux, who is the current President; and Eva Mazerolle. 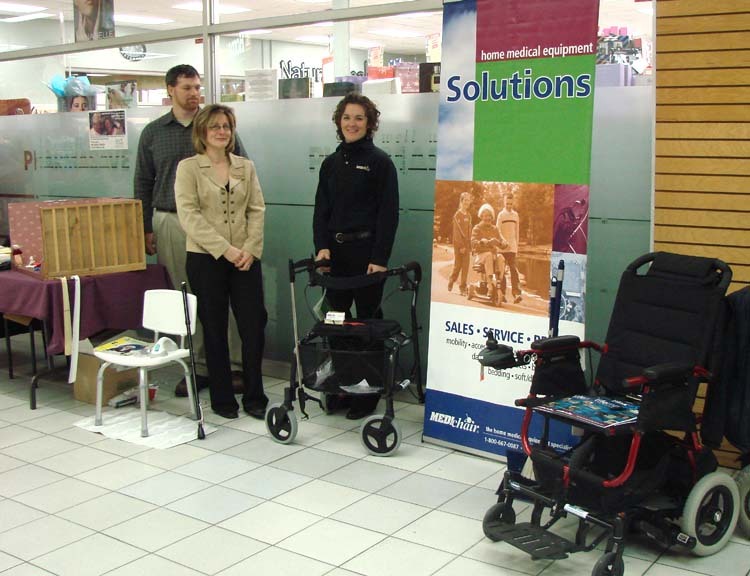 John Richer, Program Director for the Older Adult Centre was in the Hanmer Valley Shopping Centre on November 17, 2006, along with France Spencer of Helpline Sudbury, in the middle of the photo and to the right, and Tina Duguay of Medi Chair Sudbury. The three spent the day operating a display promoting awareness about fall prevention for seniors. This is a program that is directed by the Sudbury & District Health Unit. Statistics show that one in three adults age 65 and over fall at least once a year. Some of these falls can be a "life-changing" experience, even leading to death in some severe cases. Most falls actually happen in and around the home, so one's home design, furnishings and lifestyle all affect your risk of falling in your home. Furthermore, falls are responsible for 86% of injury admissions for people aged 65 and older, so by educating seniors on fall prevention measures, it is hoped that these statistics will be greatly reduced. "Falling is a major concern among seniors, especially ones who live alone and may end up breaking a hip or leg with no way of calling for help," explained France Spencer. "There are some falls that are caused by medication or things like heart attacks, but many falls can be prevented just be 'safe-proofing' your home. Our goal is to help seniors look for problem areas and even help them select walking aids if necessary in order to avoid some of the risks." Regular exercise can help you maintain muscle, bone strength and flexibility, reducing the risk of injury. It is important to eat at least three well-balanced meals per day to avoid weakness, dizziness and fatigue. Rushing increases your risk of falling. Take your time. Plan ahead so that you do not need to rush. Have regular check-ups as changes in vision, hearing, bones and muscle can lead to falls. Clear objects from stairs and traffic areas. Be aware that some medications can make you sleepy, dizzy or lightheaded. Discuss side effects with your doctor or pharmacist. Wear supportive footwear with non-skid soles indoors and outdoors. Research tells us that those who are isolated, lonely and less active have more falls and more serious injuries. A cane or walker should be fitted correctly and used as recommended. Consult your doctor or pharmacist for assistance. Avoid small rugs or mats that could slide or bunch up and cause someone to trip. Night lights can be used to brighten dark hallways, bathrooms and stairs. Do a safety check of your home. 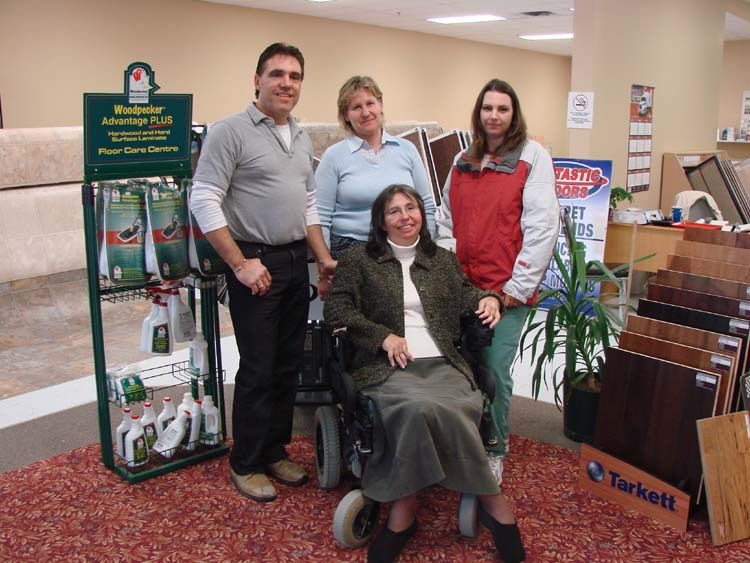 Basic safety features include secure handrails, well-lit stairs, night lights, non-skid bathmats and grab bars. For more information about the Older Adult Fall Prevention Network, you can call 522-9200, Ext. 520.